Some of the best inspiration and creativity in life comes from experiencing it and seeing it elsewhere, someone else’s masterpiece sparks ideas and excitement to go off and create your own. Be it in fashion, architecture or cooking- we are all parroting on and adapting what we have seen before. It’s also that familiarity you get when you see something that you understand and have seen before, its safe and comforting- be it a new house with big sash windows or a whimsical looking floral summer dress- we as humans innately love that sense of times before. Yes, new and different is exciting- a cutting edge glass modern house or crazy latex leggings- but doesn’t always appease everyone- this is the same for most cooking, the classics will always be here to stay, but with interesting twists and changes. On a recent trip to Istanbul, Jemima went with a few girlfriends and her sister for the weekend. Which will now be a once a year event to take off leaving babies and husbands and pick somewhere buzzing and cool in the world (husbands be warned). The itinerary was filled with a long list of amazing eateries, the best thing about traveling with 4 foodie ladies. We made sure to eat all the different fare the city had to offer us, and in many different areas- through a world that feels ancient and enchanting- the call to prayer erupting across the city- with winding alleyways with old Turkish men huddled around drinking tea, smells of sweet grilled meats and the bustle of the souks. Its impossible not to get carried away by the nostalgic romanticism of the Ottoman Empire long past. Istanbul is immense, its huge! Spreading across two continents (Asia and Europe), unlike any other city in the world, with over 14 million people. At times it feels intimidating, a little terrifying and hectic- but then this is what makes it so exciting. The theatre of it all, the Spice Bazaar, the spectacle of the mosques towering high, the noises of modern life beeping away from morning to night- which is then contrasted with a city that feels reaped in history, tragedy and beauty. You get the sense of the strength of Istanbul- through the rise and fall of empires- it will endure! But above all for us it was one of the most thrilling foodie experiences. From insanely flavoursome meze feasts- delicious slow cooked fennel with tangy feta, to mind blowing courses of breakfasts- it feels like breakfast is one of the most important meals there, serving sweet tomatoes with labneh, shashuka and tasty homemade breads and cheeses, to Turkish ravioli called Manti served with garlicy yoghurt and sumac, or to our favourite being the kebabs. Outstandingly well flavoured, spiced lamb mince manipulated around skewers and cooked over coals with flatbreads and pickled chillies- so upon arrival home we lit the Big Green Egg and got creating this dish. Choosing to use chicken to keep it a little lighter. A taste and an adaptation of our trip to Istanbul. 1. Pulse chicken thighs in a blender under coarsely chopped. Add to a bowl with you remaining ingredients. Mix well. Leave to cool and firm in the fridge. 2. Mix your dressing ingredients together, taste to adjust. 3. Leave a bowl of cool water next to you on the counter. Take a handful of the chicken mixture, place it around the skewer, dip your hand in the water and shape the meat into a long kabab. When done place in the fridge until ready to go. 4. Add your sliced onion to the vinegar and leave to pickle for 15-30 minutes. 5. Prepare your charcoal or gas grill, when hot, place the skewers over the grill, turning them every few minutes until each kabab is fully cooked. Drizzle over olive oil and a little squeeze of lemon. Roughly chop the kebab into a few pieces. 7. Quickly flash your flatbreads over the heat. 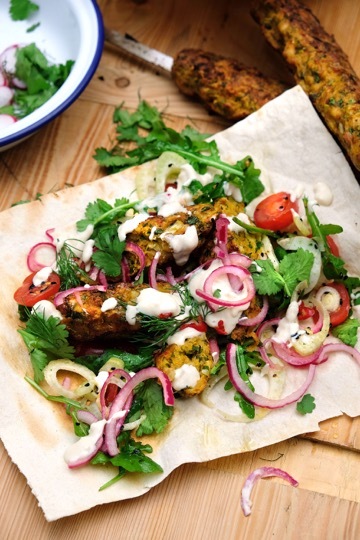 Take off and add the salad, then the kebab, then a generous drizzle of tahini dressing, then the pickled onion (discard the vinegar)- then garnish in herbs and chillies.